Petition – please Sign NOW – Save Paul Watson From the German Authorities – Angela Merkel. 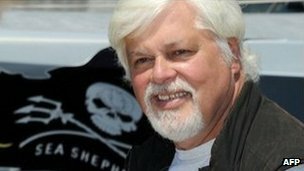 The founder of US-based anti-whaling group Sea Shepherd, Paul Watson, has been arrested in Germany, the group says. In a statement, it said Mr Watson was detained in Frankfurt and now faces extradition to Costa Rica. It quotes German police as saying the arrest relates to a confrontation over shark finning in 2002. Sea Shepherd is a controversial direct action group best known for disrupting Japan’s annual whale hunt. In the past there have been collisions between its vessels and the whaling fleet, and its activists have also boarded Japanese vessels. The German warrant related to an “alleged violation of ships traffic” which took place in Guatemalan waters in 2002, the group said, when it “encountered an illegal shark finning operation” – referring to the practice of catching sharks, slicing off their valuable fins and returning the shark to the water where it will usually die. On order of the Guatemalan authorities, the group says, it instructed the crew of the Costa Rican vessel in question, the Varadero, to head back to port to be prosecuted. “While escorting the Varadero back to port, the tables were turned and a Guatemalan gunboat was dispatched to intercept the Sea Shepherd crew,” the statement claims. “The crew of the Varadero accused the Sea Shepherd of trying to kill them, while the video evidence proves this to be a fallacy. Media cite Costa Rican reports as saying Mr Watson also faces an outstanding warrant for attempted murder stemming from the same incident. According to Sea Shepherd, Mr Watson is being assisted in jail by European deputies Daniel Cohn Bendit and Jose Bove. “Our hope is that these two honourable gentlemen can set Captain Watson free before this nonsense goes any further,” Sea Shepherd says.